WHEW! I survived! Yesterday, I was a multi-tasking queen and managed to get through all my assignments and feel proud of the work I turned in! Now I can relax...for a few days! Enjoy today's post! As I've mentioned before, I can't imagine living anywhere other than THE South. At home, I have this sign in my bedroom. I bought it at one of my absolute favorite stores, Tweed in Richmond. If you can't read it, it says: "The place where... 1) Tea is sweet and accents are sweeter. 2) Summer starts in April. 3) Macaroni & Cheese is a vegetable. 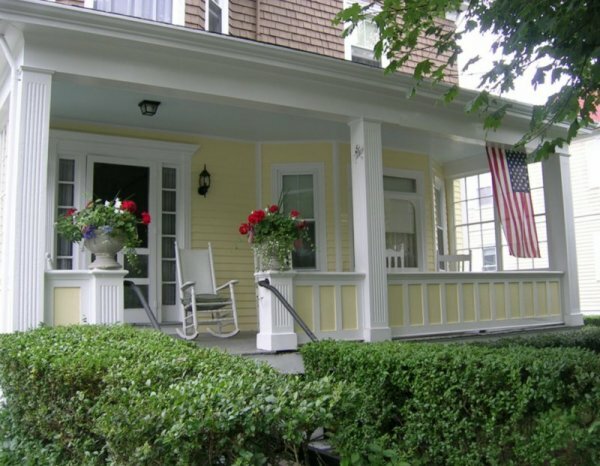 4) Front Porches are wide and words are long. 5) Pecan Pie is a staple. 6) Y'all is the only proper noun. 7) Chicken is fried and biscuits come with gravy. 8) Everything is Darlin'. 9) Someone's heart is always being blessed." There is SO much I could post about just based off of this sign, but today I am going to focus on number 4: "Front Porches are wide..."
Thanks to Aunt Patti for snapping this pic and sending it to me! 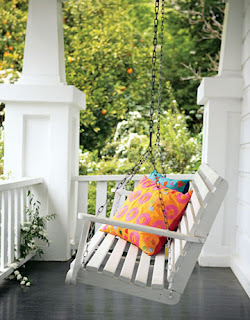 My dream home will have a HUGE front porch with a swing and some rocking chairs. 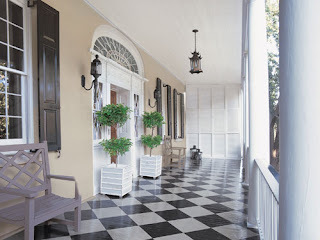 Today, I want to pay homage to the South's amazing porches and share some lovely ones I found online! I could rock in that swing for hours! I can just picture my (future) kiddies playing on this bench! stately columns, windows galore, hydrangeas...YES PLEASE! I'm convinced...my future home will have a pink door! Images found via Google Image Search, House Beautiful, and Veranda. Does your house have a front porch? 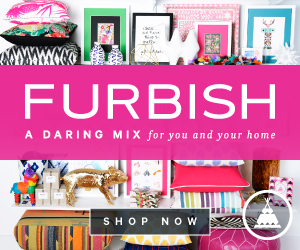 What are the "must haves" of your dream home? As a side note, special thanks go to Jenny at Something Old, Something New (if you have not read her blog, you must check it out!) 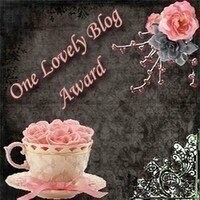 for the "One Lovely Blog Award." As part of this award, you're supposed to share 7 random facts about yourself and award 15 other bloggers! So, here goes! The word verifications when posting comments crack me up! Most recently I was tickled by "goons." I'm super organized and a neat freak, but when I get busy, my room becomes an absolute wreck. This semester, with 7 classes, I have been quite busy, so typically Thurs night-Mon morning my room is clean, and then Mon night-Thurs it's a wreck! I'm a huge nerd and like to sit in the front in most of my classes. I'm a lefty, but play most sports with my right hand. I've always been a "Daddy's Girl" but in the last 5 or 6 years my mom and I have also become the best of friends. I willingly hang out with my parents more than any other college kid I know! I'm a complete girlie girl, but also love the outdoors and to get dirty on occasion, especially when I'm at the lake or river. And for the fifteen of you I'm going to award: Flip Flops & Pearls, Fried Green Pickles, Happiness Is..., Hines-Sight Blog, Life in the Sweet Virginia Breeze, Lizards and Lollipops, North Meets South, Pink Champagne, Pretty Pink Tulips, Ruthie Relishing Life, Simply Southern, Southern Inspired, Southern Somedays, spark, and WhatMissLoves! I need that sign! I love it, it's oh so ture. Thanks for the award. I will try to blog it after my beach vacay as tomorrow is my last post til Easter! 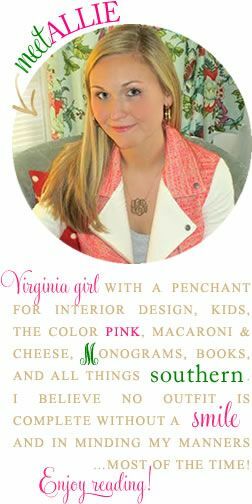 Have a fab day sweetie and if you have a recipe (something southern, but ofcourse!) to share, please link ip for my recipe swap tomorrow. PS-thanks for your sweet sweet compliments! The south, sipping lemonade, gossip sessions, late nights talking to loved ones, and relaxation.....funny how something like this symbolizes a certain mood or vibe! And just to be a comment whore, my parents painted the roof our our screen porch "Honolulu blue" and I love it!!!! thanks so much! and love love the porches, I miss mine at home its a wraparound! Thanks for the award, you're so sweet! And porches are a necessity. I love the old sounthern homes with wrap around porches on both the main floor and the second floor! That way, almost every room connects to the porch. I love porches - I miss ours at home so much while I'm at school! Also, I love to hang out with my parents - my mom and I are best friends and talk pretty much every day. I, too, love porches. That pink door is so unexpected and to die for! I love walking in New Orleans because almost every house has an amazing porch! I have that sign too! Love it! I'm glad you were able to get all of your work turned in...now it's time to enjoy the weekend! I hope it's fabulous! Aw Allie thank you so much!!! I am so excited. This is really sweet. I of course love your blog and would give you this award back if I could haha. 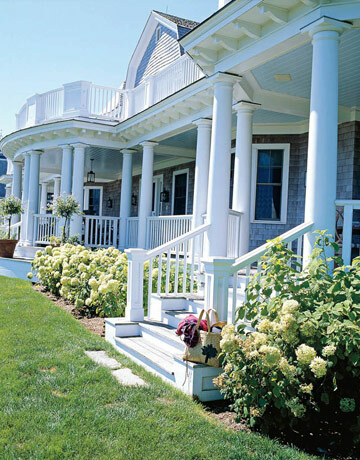 Those front porches are amazing!! I really want one for my future dream home. Thank you so very much. You are so nice to give that to me. I loved this post a lot. You nailed it! I love a yellow house, too. I have a small front porch, but my daughter Liza loves to climb the steps. We use our screened porch though. I"m very behind in posts so I will mention this award. 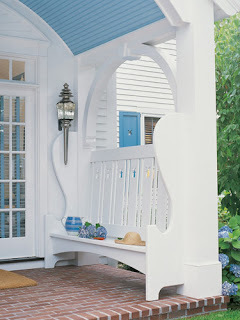 What adorable pictures of porches! 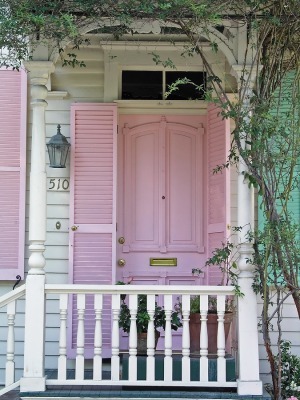 I would love to have a pink front door one day but I doubt my man would ever go for it! I grew up in NC, so that cute little sign really reminds me of home. Especially front porches! I dont have a front porch but I do have a huge back porch that faces the road. I love sittig out there watching so-and-so go by, bless their hearts. have a great day! I have this sign and I love!!! This is such a darling post!! As a died-in-the-wool Texan (Southern, but you know how we like single our state out) now living in the Northeast, it's refreshing to be reminded of what makes living in the South so special. I think some day I'll be back down there. But, in the meantime, I'll look to you to keep me informed! Thank you SO much for this award! You made my day! YES! A front porch is a must! Love the black and white tile porch - too die for! I live in a townhouse so I don't have a porch, but I miss them so much! And I love that sign!! I need it! There isn't anything better than a great porch to sit on and shoot the breeze with people you love...and these are so pretty...congrats on the award, you sound like a pretty busy and well rounded girl! Hey, everyone's room gets messy sometimes! Thank you, girl! I will have to put some thought into the 7 random things about me. Hmmmmm. This should be interesting! ahh i love porches! i could probably sit in that rocking swing all day! also, congrats on your award! Oh, I love that yellow house. And I need that first sign. Congrats on your award, it's so cute. I also posted about porches today, as did Sally Lee by the Sea! I guess porches are definetly on alot of our minds! Surfed in thru Sally Lee's---wanted to say hi and letcha know I'd been here! Have a great Friday, come visit my blog sometime and my "carolina cottage' shop--where EVERYTHING IS SOUTHERN!! Thanks for the sweet comment about my blog! Hope you have a fabulous weekend! Thank you for the shout out and award...and you KNOW I love front porches! I want that sign so bad! I also love porches, something of the South I've fallen in love here as a transplant. Everyday on the way to work we pick out the porches we'd love to have. Sigh... I want a porch! Living in the city is all well and good, but sometimes nothing beats relaxing on the porch with a drink on a summer night!! Fabulous post! I love, love, love the second and third images! I have a huge front porch at my house, and during the summer, my parents and I will just sit out there and drink tea with our dog--it's wonderful! Hope you have a great week! Congrats on your award, its so well deserved, twice! I love all the facts about you and that you are so proud of your southern heritage, don't blame you and I am quite proud to hail from the south as well even though I have been a "northerner" for 26 years, the south is in my blood and its not going anywhere! Love those darling signs above and your front porch images.....just beautiful!